Key Croatian war crimes suspect Ante Gotovina has been remanded in custody in Spain, before his expected transfer to the UN tribunal in the Hague. The third most-wanted suspect from the Balkan wars could be extradited as early as Friday, following his arrest in the Canary Islands on Wednesday. His lawyer said his client would probably plead not guilty. The general has denied responsibility in the past, the lawyer said. 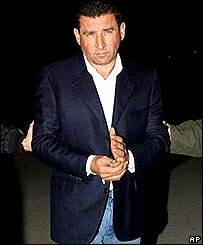 Croatian Prime Minister Ivo Sanader said the arrest proved Croatia was right when it said Gen Gotovina had fled abroad. UN chief war crimes prosecutor Carla Del Ponte said she hoped efforts would now be stepped up to arrest the top two men on the tribunal's most-wanted list. The retired general was arrested in a hotel restaurant on the island of Tenerife on Wednesday night, the Spanish interior ministry said. He was said to be in possession of a false Croatian passport with an assumed name. Gen Gotovina was flown to Madrid on Thursday and taken to the High Court, where a judge read him the charges against him. It was unclear when he would leave for the UN court in the Netherlands, although Spanish media reported the move could be as early as Friday. Throughout the tribunal's efforts to track him down, Gen Gotovina has maintained support from a wide section of the Croatian public, some of whom regard him as a national hero.